The Environmental Justice movement holds its roots close to the Civil Rights movement and seeks to promote and establish environmental health and equity as a basic human right regardless of one’s race, color, ethnicity, or income. Environmental benefits and burdens aren’t always fairly distributed among societies and historically racial minorities and the poor have been disproportionately subjected to industrial pollution, waste sites, and other toxic materials which undermine the health and well-being of a community. The Environmental justice movement seeks to expose potential sources of environmental inequality and racism, and by doing so, encourage communities to take part in fighting for social change to establish environmental equity and well-being. Our environment is the foundation of our community and its health is vital to our own. Homewood-Brushton is a neighborhood on the North-Eastern border of Pittsburgh, PA. The community’s rich history begins when it was settled by Pittsburgh’s tycoons including Henry Clay Frick, John Heinz, George Westinghouse and Andrew Carnegie who sought “the country life” over the hustle and bustle of an increasingly polluted Pittsburgh. As Pittsburgh grew on the back its booming steel industry, so too did Homewood-Brushton and by 1910 became one of the city’s largest neighborhoods. The community saw massive investment including in its housing stock. By taking a drive through the neighborhood, one can see that some of these homes remain standing today. The decline of the steel industry coupled with effects of suburbanization had a devastating effect on Homewood-Brushton. Additionally, the community suffered from racial tension throughout the 1950’s resulting in Homewood-Brushton becoming increasingly segregated into the 1960’s and 70’s. Homewood-Brushton saw continued disinvestment through this period that led to a crumbling housing stock and an increase in vacant lots, which pose significant environmental concerns due to potential soil contamination. While the past several decades have been rather bleak for Homewood-Brushton, the future is brighter than ever. Together we can make historic change and a healthy environment for Homewood-Brushton is the first step. A convenience sampling method was used in this study to select three sampling sites due to Homewood-Brushton being split into three neighborhoods: Homewood North, South and West. The study chose three locations where there is a high rate of activity and communal gathering to better understand human ecology at work in these neighborhoods: Westinghouse High School, Homewood-Brushton YMCA and Homewood Senior Center. Soil tests conducted near Westinghouse Academy (6-12) revealed 2,509.58 mg/kg (milligrams of lead per kilograms of soil). Homewood-Brushton YMCA showed 319.40 mg/kg and Homewood House Senior Center showed 295.94 mg/kg. For reference, lead occurs naturally in soils at concentrations that range from 10 to 50 mg/kg. Taking 30 mg/kg as the base average, preliminary data indicates Westinghouse Academy has approximately 100 times the acceptable concentration of lead in its surrounding soil. The YMCA and Senior Center revealed 10 times the acceptable concentration of lead in its surrounding soil. Homewood-Brushton’s geography plays a significant role in our study. The community’s natural terrain is relatively flat while surrounding areas are more elevated; these characteristics mean that a large portion of precipitation run-off finds its way to the sewer system under Homewood-Brushton and therefore places Homewood-Brushton in a “point of connection sewer shed”. Considering every 3rd lot in Homewood-Brushton remains vacant, with an overall lot vacancy average of 37.45%, soil quality and run-off, coupled with the current unsatisfactory state of Pittsburgh’s sewer system, means soil contaminants can potentially pose a significant problem not only to Homewood-Brushton residents but to Pittsburgh’s environmental well-being as a whole. The potential large scale problems associated with Homewood-Brushton’s dangerous soil quality makes further study and the implementation of solutions an utmost priority that requires the attention of the community and the city’s government as well. 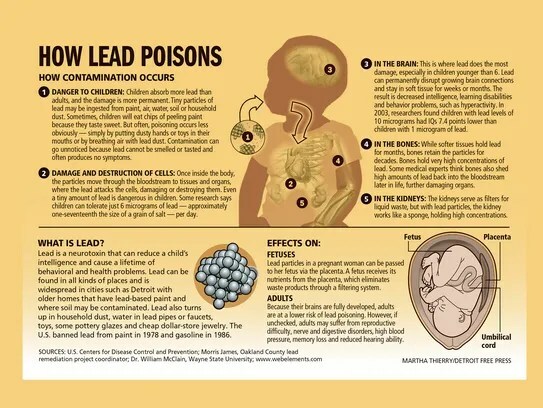 Long term effects of lead exposure include diminished cognitive function, increased aggression, and eventually heighten the cycle of poverty and make it even harder to break out of. Lead blood levels of greater than 10 micrograms can greatly affect these factors and cause lifelong health consequences. The incredibly high lead soils levels found at three sites in Homewood-Brushton pose a danger to the health of community members and have the potential for high blood lead levels for those who live in the community. Solutions to the lead soil level and exposure issue in Homewood-Brushton must be explored. This preliminary study requires further attention. A more comprehensive study is paramount to assess soil qualities and how soil contaminants effect Homewood-Brushton in regards to public and environmental health. Potential Solutions – We can all play a role! It’s clear immediate action must be taken to address poor soil quality in Homewood-Brushton. While many solutions may take time to implement, others can begin right away. Informing the community about the concerns of soil contamination and lead exposure in their community is paramount. Many resources are available to begin an education campaign regarding the hazardous effects of lead and how to limit exposure. These are invaluable tools that anyone can utilize to benefit individual families in Homewood-Brushton. The EPA has comprehensive page dedicated to minimizing lead exposure and is an excellent education resource. Allegheny County Health Department’s Lead Poisoning Prevention Program seeks to eliminate the dangers of lead exposure and provide inspections to qualified households. They also provide information regarding blood lead screenings. Pittsburgh Sewer and Water Authority provides information on lead levels in drinking water and how to reduce exposure. Additionally, they provide free water testing to order a free lead test kit call one of the listed numbers: 412-782-7552 or 412-782-7554 between 7:30 a.m. and 4 p.m.
Our teachers are crucial to this process. CLEAR Corps has an excellent page for our educators and how they can help identify potential lead health issues in students. Furthermore, a comprehensive study must be planned and executed to explore soil quality throughout Homewood-Brushton and other Pittsburgh communities with high vacancy rates. Our city has the higher education resources to uncover environmental issues and create solutions. We encourage students and organizations to use the information we’ve presented to further expand our study and we suggest a collaborative approach future efforts. Other solutions are present, but may take time to implement due to costs; however, this isn’t an excuse for inaction. The community and concerned Pittsburghers must organize to ensure the city takes the appropriate measures to assist in reducing hazardous soil contaminants in Homewood-Brushton as well as similar neighborhoods with large concentrations of vacant lots. The URA has control of a large proportion of vacant land in Homewood-Brushton. A suggested plan involves the repurposing of vacant land into green infrastructure. This is a practical solution because the city has until 2036 to come under EPA standards with its flawed sewer system. The City of Pittsburgh has approached this issue with an emphasis on utilizing green infrastructure to reduce the amount of stormwater run-off entering its sewage system. Given Homewood-Brushton’s geographical location, vacancy rate and soil contamination levels, the area provides massive potential and prioritization for green infrastructure construction; however, this must be completed with the the input of the community. This process also offers the potential for community involvement into the future and could possibly lead to job readiness programs and job creation due to land management required for the maintenance of green infrastructures. Also, check out these programs to help with this cause! Homewood-Brushton residents can also do their part to help reduce stormwater through a program offered by the Nine Mile Run Watershed Association that offers free rain barrels. Have a great idea for green infrastructure? Pittsburgh Water and Sewer Authority has a grant program in place to help in planning and constructing green infrastructure. Removal of contaminants has been successful in the past, but this is particularly costly. The process involves removing a layer of contaminated soil and replacement with a clean soil. However, this method presents issues when disposing of the contaminated soil. Considering the scale of vacancy in Homewood-Brushton, this method should be used only in the most highly contaminated areas. Additionally, we invite everyone to participate by making suggestions in the comment section at the bottom of the page regarding resources, ideas, or plans for the future environmental well-being of Homewood-Brushton. G-Tech Strategies is a non-profit who sees the potential of vacant space. Rebuilding Together Pittsburgh aims to improve communities one house at a time. See if you qualify. Operation Better Block has a unique and inspiring vision for Homewood-Brushton which was developed with the help of the community. Also they provide educational and work readiness opportunities through their JR. Green Corps program. Adopt-A-Lot is a program through the Pittsburgh’s Department of City Planning that seeks to work with willing volunteers who see the potential present in vacant lots. Check out their Vacant Lot Toolkit to find some inspiration and discover the resources needed to make a positive change. Lots to Love is similar to Adopt-A-Lot and share a common goal to turn vacant lots into community assets that promote investment and community well-being. Urban Matters is an arts and education program ran by the Urban Redevelopment Authority of Pittsburgh who seeks to empower our youth in distressed neighborhoods with an emphasis on social justice. Additionally, please utilize this Printable Resource Page developed with the help of Rebuilding Together Pittsburgh. Vacant lot, or Homewood-Brushton potential?